It should come as no surprise that Forrest Gump, the Oscar-winning 1994 movie about how a bumbling white guy shaped modern America, was going to have a sequel. After its success proved that audiences were willing to accept a dim Southerner who unwittingly stumbles into the era’s most defining moments, a follow-up was being planned in the early ‘00s. The problem, according to a Yahoo! 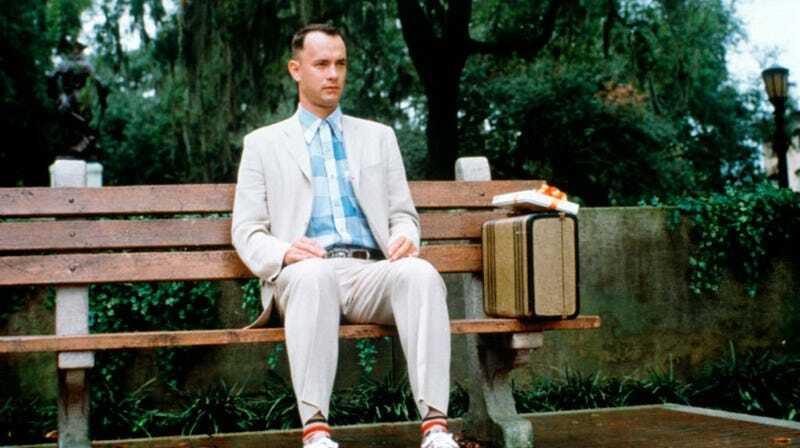 Entertainment interview with Gump/Gump 2 screenwriter Eric Roth, was 9/11. Roth turned his finished script in on 9/10. So, yeah. Forrest Gumper wouldn’t just tackle era-appropriate cultural issues, though. It, like its predecessor, would find ways to get Hanks involved in a chocolate box’s worth of memorable historic moments. “I had him in the back of O.J.’s Bronco,” Roth tells Yahoo! “He would look up occasionally, but they didn’t see him in the rearview mirror, and then he’d pop down.” As if this wasn’t enough, Gump would also have danced with Princess Diana at a charity event and found himself caught up in the Oklahoma City bombing. Roth, Hanks, and Gump director Robert Zemeckis met on September 11 to discuss the movie and, as Roth remembers, “ … everything felt meaningless,” including his story about a hapless American tripping his way through the last years of the 20th century. Considering how the nearly two decades since the movie was canned turn out, though, the terrible-sounding Gump 2 plot sounds like it couldn’t have fit our times more perfectly.